Court files recording details of World War Two code-breaker Alan Turing's convictions for homosexual acts have gone on display for the first time. One of the documents, to be displayed at Chester Town Hall, shows the mathematician admitted "acts of gross indecency" at a trial in 1952. He then underwent chemical castration. 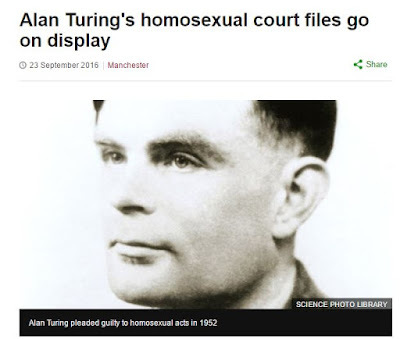 Get ready for the 'homosexual' media to make their usual howlers; he cracked the Enigma Code, he deffo committed suicide etc etc.